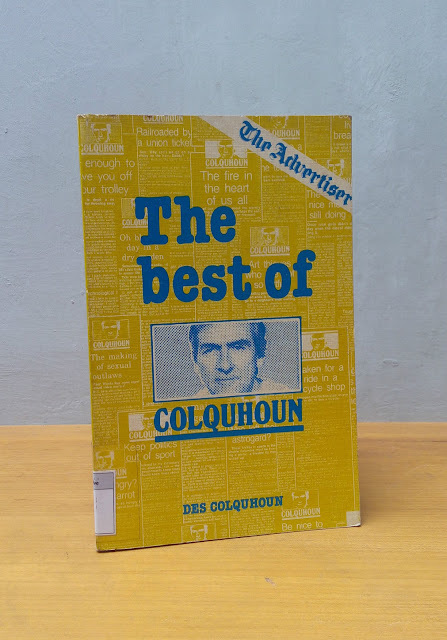 Des Colquhoun- pronounced, if you can manage it, Ca-hoon- who began writing his regular column in The Advertiser in March, 1981, has had a long association with journalism. He joined The Advertiser as a copy boy in 1948, and worked as a cadet, reporter and sub-editor before representing the paper interstate and overseas. On his return to Adelaide he worked in senior editorial and executive posts before becoming editor-in-chief in 1970. In 1979 he was appointed general manager of the newspaper division of Advertiser Newspaper Limited, but resigned from this position in 1980 because he wanted to write. During a year's leave of absence he wrote three books, "only to discover no-one was the least bit interested in reading or publishing any of them." At the end of this period he began writing his column, which has since become something of an institution in South Australia. "I enjoy doing it" he say. "It beats working for a living." In 1983 he was made a Member of the Order of Australia for service to the media. He married, with two children.